Nonchalantly peering down the hall, it quickly became clear that escaping without the other four doors noticing would be impossible. 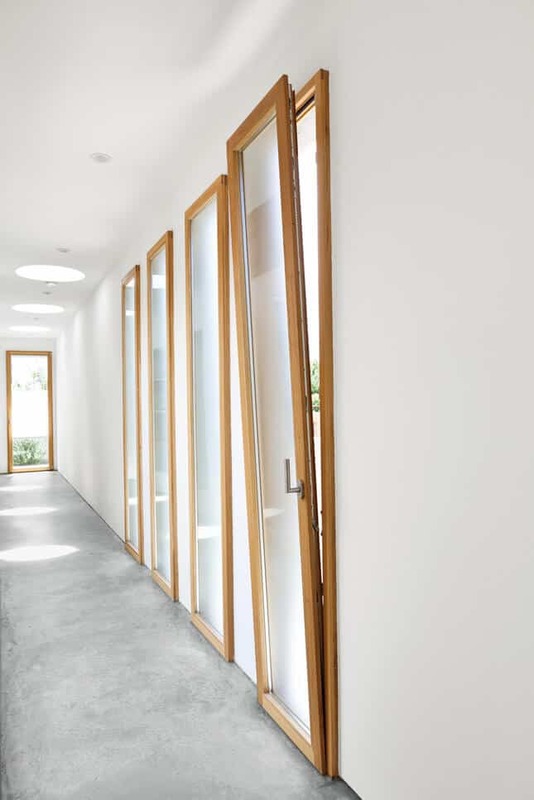 Door and windows are treated exactly alike in this clearly contemporary space. One could easily confuse the tilt of a window made from a door, as is seen in the layout above. The designer has used the exact same door panel as both throughways through the hall and broad, tilting outfacing windows. This scheme works wonderfully but will definitely confuse a few visitors in the process, perhaps even the owner itself. Tilt hinges are far under-utilized, being the very best choice for big, light-welcoming windows. Notice how the elegant artificial lighting ends as soon as the natural light from the tilt-hinged windows is reached. A grey polished floor carrying a marble-esque texture works well when set across the plain white walls and ceiling. Given that the passageway leads outside, the use of wood framing is quite clever. Left unpainted, this blends the solid, shiny, almost-industrial floor and the clean, minimalist white walls with large, globular downlights. It would be quite interesting to know whether only one door has been mounted to a tilt hinge, or if the designer followed the trend with each. Only one handle leads one to think that this may have been done on purpose to confuse first lookers. After all, first impressions are lasting.